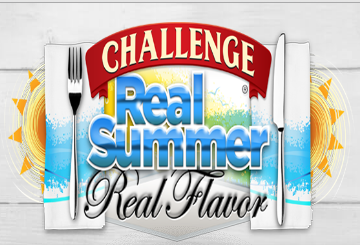 Challenge $100,000 “Real Summer, Real Flavor” Instant Win & Sweepstakes – Win $100,000! ENTER SWEEPSTAKES HERE – Challenge Dairy Sweepstakes page. ENTRY LIMIT – Limit: Each entrant may receive three (3) Sweepstakes entries and three (3) Instant Win Game plays per day during the Promotion Period. SWEEPSTAKES ENTRY PERIOD – The Promotion begins on April 29, 2016 at 12:00 a.m. Eastern Time (“ET”) and ends on September 9, 2016 at 11:59 p.m. ET. PRIZES – Sweepstakes Prize: ONE (1) SWEEPSTAKES PRIZE: A check for $10,000. Approximate Retail Value (“ARV”): $10,000. Odds of winning the Sweepstakes Prize depend on the number of eligible entries received during the Promotion Period. Instant Win Game Prizes: ONE (1) FIRST PRIZE: A check for $100,000. ARV: $100,000. ONE HUNDRED (100) SECOND PRIZES: A Good Cook prize pack including one (1) Slider Press, one (1) Watermelon Tap, one (1) Heat Resistant BBQ Glove, one (1) three (3) piece BBQ Tool Set, one (1) Corn Grilling Basket Holder, and one (1) Onion Bloom Roaster. ARV: $70.94. ONE THOUSAND (1,000) THIRD PRIZES: A voucher for free Challenge Butter product. Due to various dairy regulations, residents of the states of AR, CA, CT, ID, KS, LA, MA, MN, MO, MS, ND, NJ, NV, PA, TN, UT, VA and WI will receive a $5 See’s Candies gift card. ARV: $5.00. ONE THOUSAND (1,000) FOURTH PRIZES: A voucher for a free Langers juice product. ARV: $4.99. ONE THOUSAND (1,000) FIFTH PRIZES: A voucher for a free MCK Salad Toppings product. ARV: $3.99. ONE THOUSAND (1,000) SIXTH PRIZES: Two (2) vouchers for a free Challenge Cream Cheese product. Due to various dairy regulations residents of the states of AR, CA, CT, ID, KS, LA, MA, MN, MO, MS, ND, NJ, NV, PA, TN, UT, VA and WI will receive a $5 See’s Candies gift card. ARV: $5.00.